Will Lenovo focus on the Moto brand for mobile phones in the future? According to a rumor out of Chinese Weibo, Lenovo might plan to consolidate all of its phone business under the Moto brand. 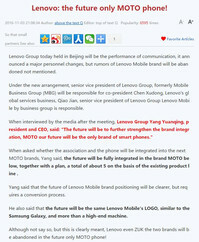 Lenovo CEO Yang Yuanqing might have confirmed this rumor after a conference in Beijing last week. The Lenovo Vibe P2, that was leaked recently, might be the last phone that might be released under the Vibe brand. Rumor has it that Lenovo has plans for a November 8th release for the Vibe P2 and the leaked Moto M. A rumor appearing on Chinese Weibo last week said that this might be the last launch of a non Moto phone from Lenovo. First dismissed as just another rumor on Weibo, there may be some truth to it after all. Apparently, Lenovo's CEO Yang Yuanqing spoke to the media after a conference in Beijing recently and confirmed, that the company has plans to consolidate all of its phone business under the Moto brand. This implies that both the Vibe and the ZUK brands will cease to exist in the future. The CEO also said, that the transition to the new brand may take some time so it might be a long term plan for the company. So far we were not able to confirm this information and there is no public announcement as of yet but we attached a Google translated excerpt from the Chinese news site who reported the information.